Free Shipping Included! 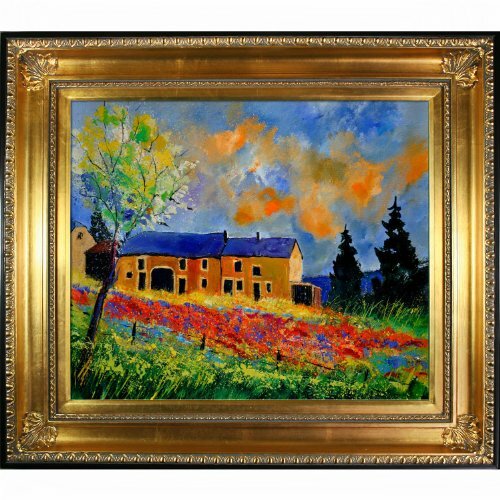 overstockArt Ledent Red Poppies in Houroy Canvas with Regency Gold Frame, Gold by overstockArt at Tecac. MPN: 2P46L1525520X24-FR-650G20X24. Hurry! Limited time offer. Offer valid only while supplies last. Red poppies in Houroy is a canvas print of a colorful modern Ledent painting showing a field full of poppies and the village of Houroy landscape. Red poppies in Houroy is a canvas print of a colorful modern Ledent painting showing a field full of poppies and the village of Houroy landscape. Originally oil on canvas. Pol Ledent was born in 1952 in Belgium. He came to painting in 1989. He started with watercolor but felt rapidly that oil painting would match his way of being. He is a self-taught painter. Nevertheless he took some drawing lessons in a Belgian academy. After taking part into numerous group exhibitions, some galleries in Belgium proposed to him to exhibit his works. Dinant, Bouillon, Brussels, Paris and Moscow in October 2006. Frame Description: Regency Gold Frame - Gold Finish. Framed canvas print size (not including frame): Classic 20" X 24"